When you hear the word Attic, don't think of the eaves above the house or the unfinished and uninsulated space where you keep old books and bags of thrift store donations - think of the bathroom. Including the styles of ancient Attica - a region of Greece - and a few Mediterranean hints could give your home's bathroom an exotic appeal ideal for any season. Weather the winter with a steaming shower in your warm-toned tile shower stall, or relax in a porcelain tub surrounded by classical columns. Stay cool all summer with the pleasant chill of mosaic tiles underfoot and the airy spaciousness of your walls. With a climate as varied and yet consistently gorgeous as the Mediterranean, it's no wonder that these designs adapt so well to any season. Looking to touch up your bathroom with a little Roman, Moroccan or even Attic influence? Look no further, and consider these four suggestions. 1. Wrought iron frames, handles and knobs. This classic European influence is sure to capture the rustic charms of the Italian seaside. Utilize it in everything from bathroom vanities to your medicine or linen cabinets. Consider framing a mirror in wrought iron as well for a pleasing blend of rough metal and sleek glass. 2. Mosaics. Whether done in porcelain, glass, marble, ceramic or some other variety of tile, these colorful decorative touches are more than just art - they become part of the very architecture of the room. Whether you craft the design yourself or choose from a variety of classical examples - from modern Malta to those discovered in ancient Pompeii - it's sure to add character to an already astounding space. 3. Color scheme. Your palette will range widely depending on what portion of the Mediterranean you take your influence from. The difference between an Algerian and Spanish color scheme is significant. But a safe combination would be a sandy hue and pearly pink. These two capture the colors of the Mediterranean's famous beaches. 4. A few atmospheric touches. 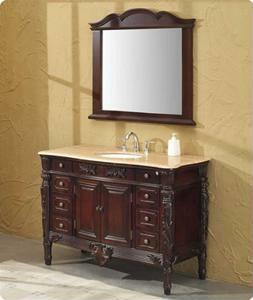 Just a few final strokes will bring your bathroom to life and transport you to another climate and culture. To lend your space an occasional extra ambiance, consider burning candles scented with the iconic spices of the region. Or, enliven the room with Egyptian cotton scented oils and fresh-cut flowers, like lavender or wild anemone, both of which are found easily enough in the U.S. Also, feel free to enjoy the region's fine wines - a glass of red would go wonderfully with a bath.